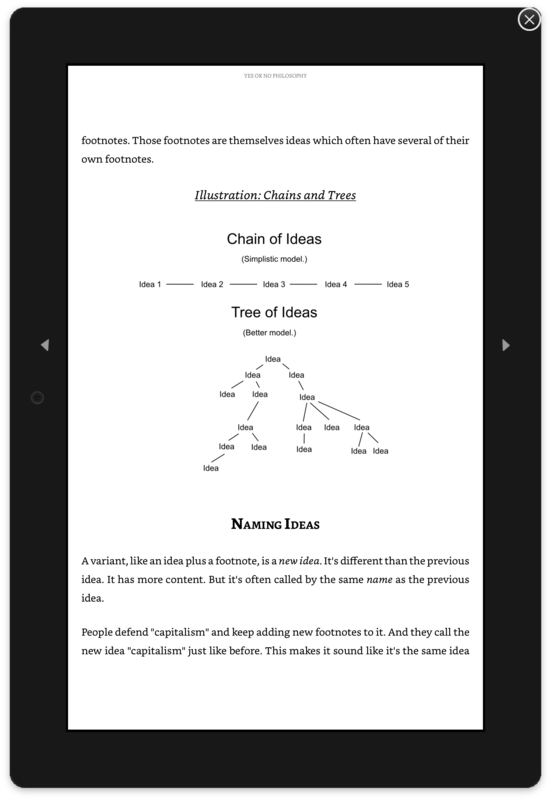 This is an educational product containing videos and writing which will teach you about philosophy. You don’t need to know any philosophy beforehand. Do you want to make better decisions? Want to make fewer mistakes? 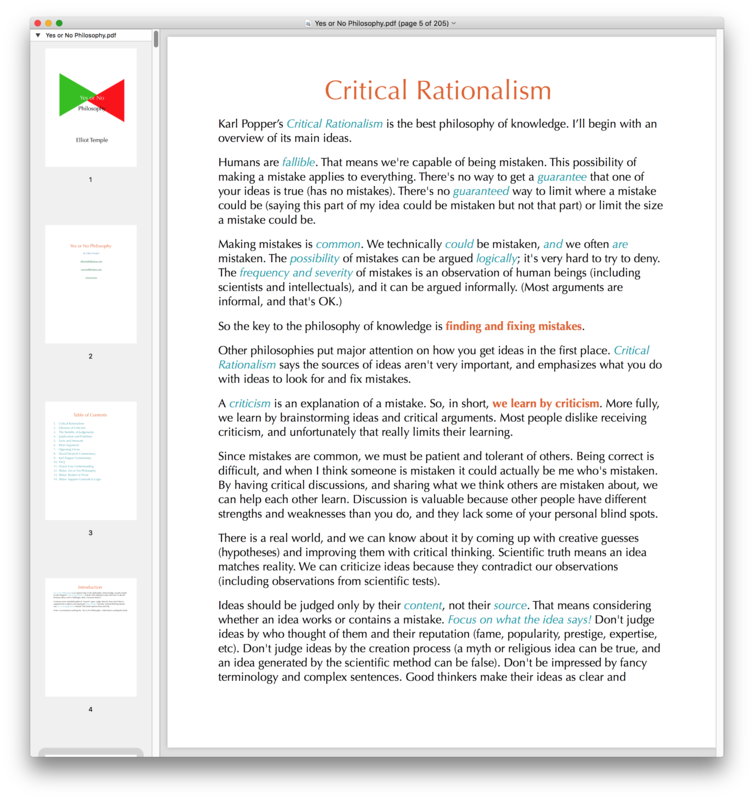 Want to be better at critical thinking, debating, learning, and figuring out what’s true? Do you care deeply about reason? 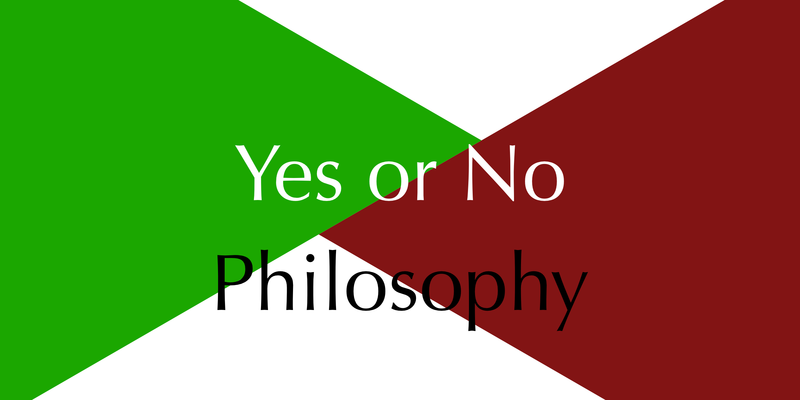 Yes or No Philosophy is the cutting edge approach to rationally evaluating ideas by using yes or no judgements. It’s the best way to solve problems, seek the truth, and learn. 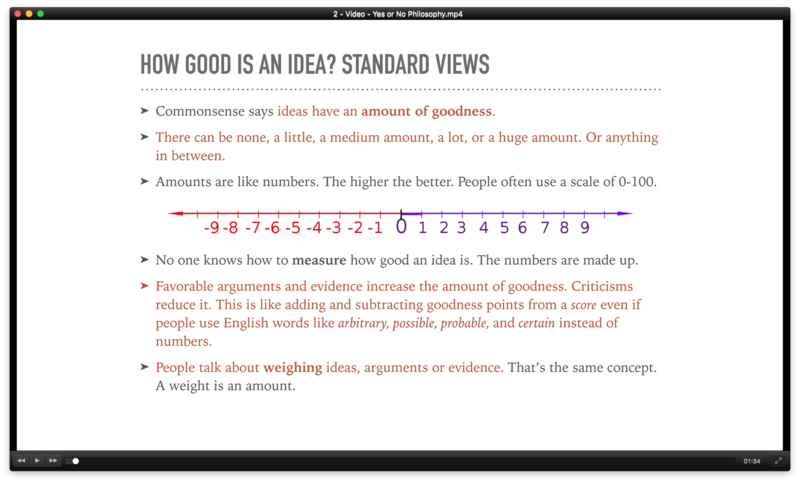 The standard myth is that rational thinking judges ideas by weighing supporting evidence and arguments. The amount of support determines how good or probable an idea is. This logically-refuted error dominates universities, intellectual discussions, and academic papers. It has now spread to most people. Yes or No Philosophy frees you from this myth and explains how reason actually works. It removes the confusion, hesitation and uncertainty from rational thinking and makes it accessible to everyone. It will let you make judgements with confidence instead of self-doubt. Knowledge is power. The world is full of opportunities which you can seize if you know how. You’ll learn how to organize your thinking with decision charts. I walk you through extended decision making examples, like choosing a pet or job, to relate philosophy to your daily life. You’ll get a clear concept of the standard view about supporting evidence and arguments, which is actually how you think today. Find out what it’s for, why it’s mistaken, and how to replace it. Discover why positive arguments are either imprecise thinking or false. I teach you how to tell the difference and clarify the imprecise arguments. You’ll learn how to judge ideas as yes (non-refuted) or no (refuted), and to make decisions accordingly. You can always act on an idea you don’t see anything wrong with (no criticisms). Compromising is an unnecessary mistake! I share a technique so you never get stuck on time-sensitive problems. You’ll learn why the burden of proof concept is wrong, and what to do instead (create a library of criticism). You’ll even learn how to argue a negative, like that fairies don’t exist, even though other philosophers say that’s impossible. Learn about logical problems with the concept of supporting evidence or arguments. The yes or no approach isn’t just a matter of taste or an optional alternative viewpoint, it’s the only philosophy that stands up to logical scrutiny. You’re fallible – capable of making mistakes. This has led most philosophers to seek a guarantee against mistakes, like self-evident foundations. Since that’s impossible, their choices are confusion, dishonesty or skepticism (denying that we can know things). I explain how to rationally deal with the possibility of mistakes. 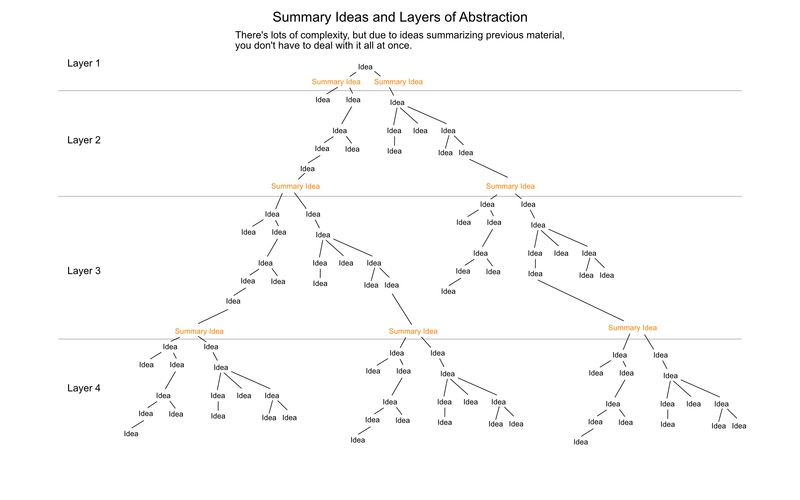 I explain how to think about ideas (including naming, variants, layers of abstraction, and footnotes). I explain the stability of judgements, how to think clearly about problems, and how to use facts. Your mind and brain are complicated. Most of your thinking happens unconsciously. With more insight into how thinking actually works, you can better align your conscious thinking to your unconscious thinking. That will fix some of your internal contradictions. I’m building on the best philosophy of knowledge, Critical Rationalism, by Karl Popper and improved by David Deutsch. I fix Popper’s errors of “corroboration” and “critical preferences”. I also mention a few connections to Ayn Rand’s philosophy, Objectivism. My presentation is self-contained so that anyone can start with it. And if you know Yes or No Philosophy first, you’ll then find Critical Rationalism easier to learn. I bring a fresh perspective to philosophy from outside the ivory tower of academia. Contrary to professors, I focus on being clear instead of sounding impressive. I make ideas accessible to regular people instead of publishing promotion-oriented papers for a few colleagues with the same speciality. I’ve studied and debated the major philosophies (and some obscure ones) without having to conform to the agendas of the philosophy journal editors and university politics. This free, unbiased pursuit of truth let me judge which philosophy is correct and get inspiration for new ideas. 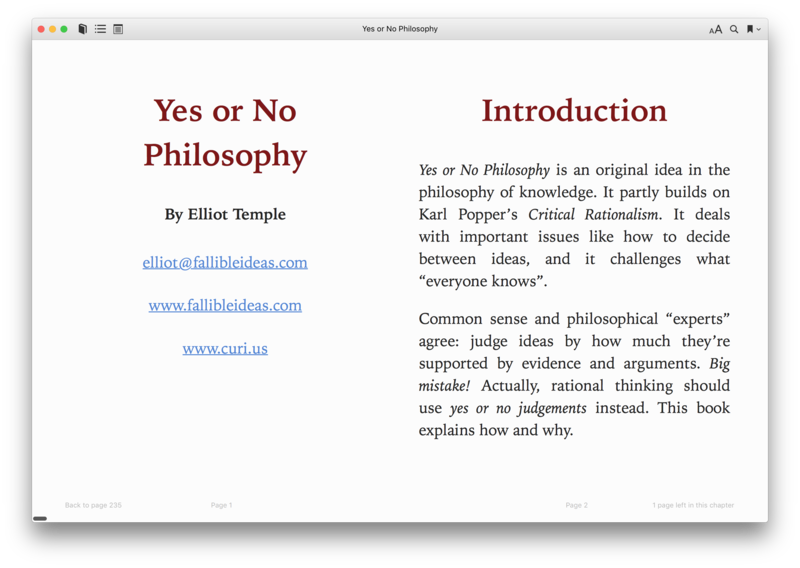 Free Sample: You can read a short argument for the Yes or No Philosophy. I write at Fallible Ideas and my blog, Curiosity. Videos are verbal explanations along with slides or viewing my computer screen. There’s no copy protection or DRM. You can open the files on any device with any software. The material is for your personal use. For other uses, like in a classroom, contact me. Buy risk free. I offer a 30-day money back guarantee, no questions asked. If you aren’t satisfied, you get a refund. 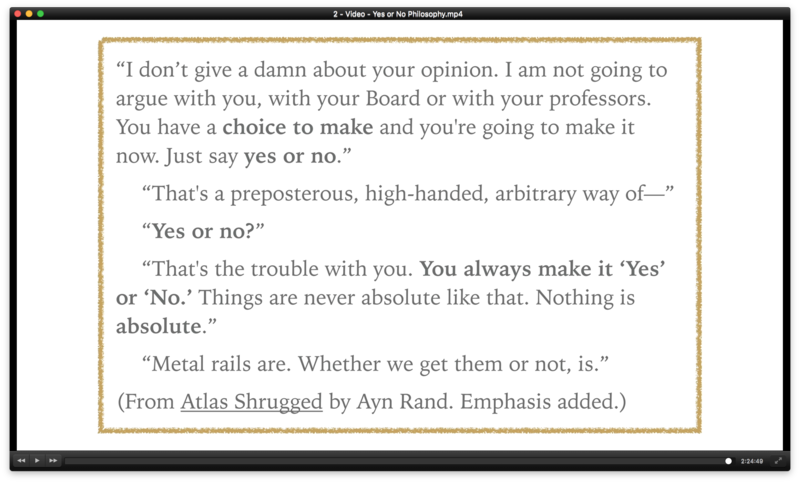 I developed the Yes or No Philosophy ideas over the last 10 years. I know it could help people, so I’ve worked hard to explain in a clear and accessible way. This is a much larger product than what I’ve sold previously, and it offers more value per dollar. But my focus is on providing value per time. Are you a middle-class adult? If so, you’re probably pretty busy! When buying an educational product, you should be concerned with how much value you’ll get compared to how long it will take you to learn it. I designed everything around a 2.5 hour video. After that, you’ll understand the main ideas and be able to start using them in your life. The other material provides elaborations and details. I’ve spent years learning what’s most important and how to explain it. I’ve tested dozens of ways of sharing ideas. For Yes or No Philosophy, I selected my best ideas and communication methods from hundreds of previous conversations and articles. And I thought carefully about how to make it even better than my past work. I also focus on quality. Most philosophy ideas aren’t very good, so who cares what the price is? These ideas are great. I’m offering cutting-edge, original philosophical ideas which you can’t get anywhere else. That’s kinda priceless. If you’ve read most of my book recommendations and free writing, and you want this product, but you really can’t afford it, then email me and we’ll talk. I’m offering around a 98.75% discount to my consulting rate. You’re buying a month of my work for the price of 2 hours. I can sell it that cheaply because other people will buy it too. Discounts are available, by request, for children or low income scholars.